Ответы на наиболее распространенные вопросы наших клиентов: выбери аргумент по которому хочешь получить более подробную информацию или выбери один из вопросов относительно продукции и сервисов Puresport на который ищешь ответ. HOW CAN YOU CARRY OUT THE BOOKING? The booking can be carried out directly online on our website in the prices section, selecting the experience you’re interested in and following the guided procedure. HOW CAN YOU CARRY OUT THE PAYMENT? The payment can be carried out with credit card/paypal or bank transfer within 7 days from the order date. IS IT POSSIBLE TO PAY WITH PREPAID DEBIT CARDS? Yes, it is possible to use prepaid debit cards selecting the “Paypal” entry. WHICH BANK DATA SHALL I USE FOR THE BANK TRANSFER? The bank data needed to carry out the payment through bank transfer will be sent to you by email once you complete the purchase. HOW AND WHEN WILL I RECEIVE THE INVOICE? The invoice will be sent by email, to the address given by you at the time of the order in the invoicing data, as soon as the order arrives in the administration offices. CAN I CHOOSE ANY DATE FOR THE EXPERIENCE? For our driving experiences there is a precise schedule for each circuit that you can see online in "date and circuit" section. Even if your purchase regards a precise car o circuit, it can be changed with any other car or circuit, with an adaptation of laps or economic adjustment, if the new choice is more expensive. WHAT DOES “OPEN VOUCHER” MEAN? HAS IT GOT ANY ADDITIONAL COSTS? The open voucher lasts for 12 months from the purchase date. Within these 12 months you must communicate a date consulting our schedule for your driving experience. It hasn’t got any additional costs. HOW EARLY SHOULD I CHOOSE THE DATE OF THE EXPERIENCE? HOW DO I INFORM YOU ABOUT IT? To book the day of the experience you can contact us by telephone or email, having your order number with you, at least one month before the based on schedule chosen date, to make sure there is availability. IS THE CAR DRIVEN BY THE PERSON WHO RECEIVES THE EXPERIENCE OR BY YOUR INSTRUCTOR? If you purchase GT or Formula laps on the racetrack the addressee of the gift will drive the car having by his side one of our instructors, who will give advice on how to drive the car at best, how to face the turns, which gears to use… If you purchase the HOT LAP product, our instructor will be driving and the addressee will be a passenger for the number of purchased laps. HOW DOES THE GIFT VOUCHER OPTION WORK? HOW MUCH DOES IT COST? The “gift” option has an additional cost of € 14 (including VAT). If this option is included in your order, Puresport will send by TNT courier the gift voucher with the letter of invitation and the dedication card inside a Puresport folded, at the address you gave us in the "shipment address section". Pay attention: the given address must be an address where the addressee is always available for the delivery by the courier. HOW MANY DAYS DOES IT TAKE TO RECEIVE THE GIFT VOUCHER? If you carried out the purchase with credit card or paypal, the shipment starts the following day (non-public holiday) of your order and normally it arrives to the destination within 2 or 3 days with the TNT express courier (any delay is due to the courier). Otherwise, if the payment is carried out by bank transfer, we ask you to send us by email the copy of the receipt of the wire transfer, so that it is possible to anticipate the bank’s timing and to send the gift voucher as soon as possible. IS THERE ANY OTHER WAY TO SEND THE GIFT VOUCHER TO THE ADDRESSEE OF THE GIFT? Of course, there is and is for free. You only have to complete the order NOT choosing the "send gift card" option; by giving the drivers information in the dedicated section there will be the possibility to write a message that will be reported in the voucher, once completed the order. You will receive 2 files, one with the order’s information and prices paid and one with the message just written by you and the order’s information, the name of the order’s addressee, but no prices. You can also print this file directly in the last passage/screen once closed the order. WHAT IS NEEDED TO DRIVE YOUR CARS? SPECIAL LICENSES? ON RACETRACK EXPERIENCE? To drive our cars it is essential to be in possession of a regular type B license and to be in good health conditions. In case the participant is aware of disorders or diseases that might affect the perfect physical condition for the sporting activity, he is required to mention it before the subscription. In this case, Puresport reserves the right to ask, in order to consider the subscription refined, a certificate of competence issued by a medical practitioner. The participant, with the subscription of this form, also states that he doesn’t make use of controlled substances and/or of medicinal products that might compromise reflexes and physical performances. For GT cars it is necessary to be 18 years old and to be in ppossession of a drving license; for single-seater cars it is recommended, other than type B drving license, at least 2 years of experience on standard road car. HOW DO I NEED TO BE DRESSED? WILL I BE PROVIDED WITH WHATEVER IS NECESSARY FOR THE CARRYING OUT OF THE EXPERIENCE? 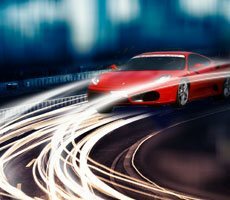 For the driving experience on GT Ferrari, Lamborghini and Porsche cars we recommend wearing comfortable and sports clothing. It is important to have rubber sole shoes in order to ensure a better grip on the pedals. We will provide you with helmet and helmet lining where needed. For the Formula experience, we will provide you with all the necessary: suit, helmet, helmet lining, gloves and shoes. If you are in possession of you own equipment, you can bring it with you and use it. MUST THE CAR BE CHOSEN AT THE TIME OF THE ORDER OR EVEN ON THE DAY OF MY ARRIVAL ON THE RACETRACK? The car must be chosen at the time of the order, because unfortunately on the day of the event everything will be already defined and it won’t be possible to make changes. If you want to modify the car chosen, it is possible, ACCORDING TO AVAILABILITY, contacting us or on the racetrack the day of the event. WHAT TIME DO I HAVE TO BE PRESENT ON THE RACETRACK? The convocation time on the racetrack and all the helpful information about the day, as well as the address of the racetrack, will be sent to you by email approximately 10 days before the date of the event. It is recommended to be on time and to bring the forms and waiver of responsibility, sent with the convocation mail, signed. IS THE CONVOCATION TIME ON THE RACETRACK PERMANENT OR FLEXIBLE? The convocation time on the racetrack is definitive and cannot be changed because it will bring difficulties for the organization of the shifts on the racetrack. HOW EARLY CAN I MODIFY THE RESERVATION DATE OF MY EXPERIENCE ON THE RACETRACK? To modify the reserved date for your experience, you need to contact us by telephone or by email at least 30 days before the date previously booked and the one yet to be reserved, giving the order number and the new chosen date. Adding, during the purchase, the "Date Change" options, at a cost of € 29, you can change the date of the experience up to 5 days before the day of the event previously booked. HOW DO I PURCHASE ANY EXTRA SERVICES THAT I DIDN’T INSERT IN MY ORDER, LIKE VIDEOS, CAMERA CAR AND ANY VISITORS? When you will receive our convocation email, approximately 10 days before the date of the event, you will be asked whether you want to add any extra services that you will be able to book and the settle on the racetrack on the day of the event with cash, credit card or bank card. CAN VISITORS ATTEND? CAN THEY GET ON BOARD OF THE CAR? 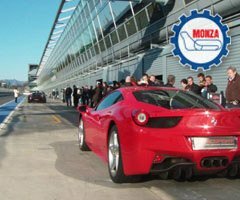 Visitors can come to the circuit together with the participant and attend the driving sessions without getting on board f the car, being these cars only with two seats, one for the participant and the other for our instructor. On some circuits it is required a visitor share of € 25 (VAT included) for each guest (referred as “visitors’ service”) which includes the entrance to the circuit, the possibility to attend the briefing and the driving sessions from the boxes to the pit lane, the possibility to benefit from the open bar service with drinks and snacks and to do the inspection lap on racetrack on a shuttle driven by a professional pilot. Kids up to 12 years old can attend without any additional cost, inspection lap on shuttle included. Over the twelfth year of age, the additional cost of the visitors’ service on the racetrack will be applied as for adults. WHAT IS THE CAMERA CAR VIDEO? WHEN AND HOW WILL THE CAMERA CAR VIDEO OF THE EXPERIENCE BE SENT? ON WHICH MEDIUM AND IN WHICH FORMAT IS IT SENT? You can download the camera car video from a link we will send to you by email within 4 weeks from the date of the experience. However, the normal time is approximately within 2-2,5 weeks. CAN I OBTAIN 2 CAMERA CAR VIDEOS, ONE ON EACH CAR, IF I PURCHASE A 2GT PRODUCT? If you purchase a 2GT product which includes the driving session on two different cars between Ferrari Lamborghini or Porsche, Puresport guarantees at least one of the two videos, but, obviously, if both were correctly registered, we will send them without any additional cost. WHAT HAPPENS IN CASE OF MISSED REGISTRATION BECAUSE OF TECHNICAL PROBLEMS? If the camera car video doesn’t work because of technical reasons, it doesn’t mean that the entire performance didn’t have a positive result, but that the negative result is only linked to the camera car video service and in this case Puresport will reimburse only the camera car video payed amount. The telemetry, is an extra service offered to our clients, with the purpose to make the video more interesting by giving additional information to the participants. However, the missing of these datas does not mean that the entire registration failed and does not imply a refund of the video and/or the entire driving experience. WHAT IS THE PURESPORT SHUTTLE? The Puresport Shuttle is a minivan car or car of other type, such as Maserati Levante, with multiple seats, which is used to make the recon laps of the circuit. Our instructor will be driving and he will show you the right trajectories, the points of braking, of acceleration and the racetrack secrets. This service is also provided and guaranteed to all guests, who have paid € 25 as guests. DO YOUR INSTRUCTORS ALSO SPEAK ENGLISH? Our instructors speak English fluently, so there won’t be problems, if the person who will have to drive doesn’t speak Italian perfectly. ARE THE DATES THE ONES ON THE WEBSITE OR THERE WILL BE OTHERS? The dates are the ones on the website in the “date and circuit” or “schedule” section. However, the dates schedule is constantly updated. Therefore, we suggest to always have a look on it or tho ask our personnel dates for your eventual demand.for all corporate events, apart from the online dates schedule, we can also offer alternative dates baed of the demand of the purchaser himself. WHAT HAPPENS IF I DON’T COME TO THE CIRCUIT ON THE DAY OF THE EVENT? If on the day of the event our costumer, who had already booked, doesn’t come to the circuit, he will lose the right to recover the experience. MUST I COME TO THE CIRCUIT EVEN IF IT RAINS? In case of rain, you still must come to the circuit not to lose the right of the experience itself, because if the racetrack is safe, the experience will take place regularly. Otherwise, if the racetrack isn’t in the right safety conditions, the experience may be suspended and then restarted or cancelled and recovered on another date. This decision is taken unquestionably by the organizer of the event. WHAT HAPPENS IN CASE OF SNOW OR FOG? In case of snow or fog the experience may be delayed. However, the event will be considered confirmed until you receive our communication of cancelling. WHAT HAPPENS IN CASE OF CANCELLING OF THE DAY FROM PURESPORT? In case it is Puresport to cancel the day of the event, you will be notified in time by email or by telephone and we will propose to you new dates from which to choose. The reasons of cancelling can be given by reasons of force majeure or by not reaching the minimum number of people planned. This last case hardly ever happens. HOW OLD IS IT NECESSARY TO BE TO MAKE YOUR DRIVING EXPERIENCES? For our GT experiences, you don’t need anything, it’s sufficient to be 18 years old and to have a valid driving license. It doesn’t exist a maximum age to make our experiences both as Hot Lap (with our professional pilot driving) and as a pilot. IS IT POSSIBLE TO MAKE PHOTOS AND VIDEOS OF THE CARS DURING THE DAY? Your guests will be able to make photos and videos of your experience from the boxes and the pit lane, so that you will have a permanent memory to share with your friends and relatives. HOW DOES THE GT DAY WORK? HOW MUCH DOES IT LAST? The GT experience lasts approximately 3 hours. Each purchased product includes: technical briefing, inspection laps on board of the Puresport Shuttle, the driving session on the racetrack on the chosen car with one of our instructors as a co-pilot, the delivering of the participation certificate, final toast and open bar service (where served). HOW DOES A FORMULA DAY WORK? HOW MUCH DOES IT LAST? 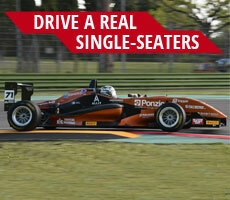 The experience on single-seater Formula lasts an entire day (from 8.00 AM to 4.00 PM approximately). Each purchased product includes: technical briefing, inspection laps on board of the Puresport Shuttle, driving session on the single-seaters as scheduled, light lunch at the circuit’s restaurant, the delivering of the participation certificate, comment on telemetry and video, final toast and open bar service (where served). IS THE KASKO INSURANCE INCLUDED IN THE GT PRODUCT? IS THE KASKO INSURANCE INCLUDED IN THE FORMULA PRODUCT? The costumer, because of the payment of € 244 + VAT (optional), supplementary from the basis amount, will be free from the repairing costs of the car except for the relief of € 8,000.00+ VAT (eight-thousand). For example, if the car will have damages for the amount of € 15,000.00, in case there is the payment of the supplementary amount of € 244.00 at the act of registration at the event, the damages will be divided as follows: € 8,000.00 due to the costumer and € 7,000.00 due to Puresport. The costumer who doesn’t pay the above amount will be obliged to pay any of damages caused by himself until the amount of € 15,000.00 (fifteen-thousand). It is to be clear that damages inside the box lane and/or with off cars, caused by total and evident negligence of the participant and by the non-respect of the security rules given by instructors (by way of example and not comprehensive: fast lap with red flag and/or black on the racetrack, fast driving without heating tires especially in the first two laps, use of alcohol of any kind during the day on the racetrack) are totally due to who causes them. I WOULD LIKE TO BOOK THE EXPERIENCE ON THE SAME DAY AS MY FRIEND, WHAT CAN I DO TO MAKE OUR CONVOCATION TIMES THE SAME ONES? To share your experience with a friend who has a driving experience with Puresport too, you have two choices: you can call us giving us the two order numbers or you can send us an email still giving us the two order numbers. Otherwise, if you already have an order number and you want to book a second order for your friend or acquaintance, you just have to put in the “notes” box of the second order the order number in your possession. Having the two order numbers, we will be able to insert you in the same convocation time. CAN I CHANGE THE NAME OF THE ADDRESSEE OF THE GIFT? CAN I HAVE THE REIMBURSEMENT IF THE ADDRESSEE OF THE GIFT DIDN’T LIKE IT? The name of the addressee is changeable even on the same day of the event, but, for a better making of the event, it would be better to inform us at least 20 days before the date of the event about the changing of the name of who shall drive, so that we can prepare the new badge for the new “pilot”. In case the addressee didn’t like your gift, we do not make reimbursements, but you can give us a substitute or decide to live the driving experience yourself. WHERE CAN WE SLEEP? ARE THERE ANY APPROVED BY YOU HOTELS?